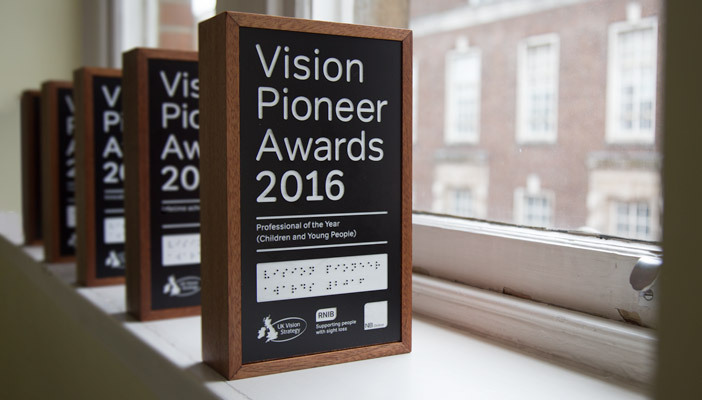 The Vision Pioneer Awards 2016 were held last night to celebrate the outstanding work of professionals in the eye health and sight loss services across the UK. This is the first year of the awards, which were created by the UK Vision Strategy, in collaboration with RNIB and NB Online. The awards champion and celebrate good practice and honour the achievements of professionals committed to supporting children, young people and adults who are blind or partially sighted. They also aim to raise awareness of sight loss and the importance of quality eye care by striving towards the outcomes of the UK Vision Strategy. The winners of the five categories were honoured at London’s Grange Tower Bridge Hotel. Simon Labbett said: "For me, being awarded ‘professional of the year’ is a massive boost for Vision Rehabilitation professionals across the UK. Whilst I certainly love the variety that my job brings and set great store by learning from each person I work with, I know that my values and commitment are no different from many of my colleagues who are doing the same job. I'm convinced that we have to make the profession much better known and appreciated amongst the general public and healthcare workers - we want to encourage more people into this line of work."